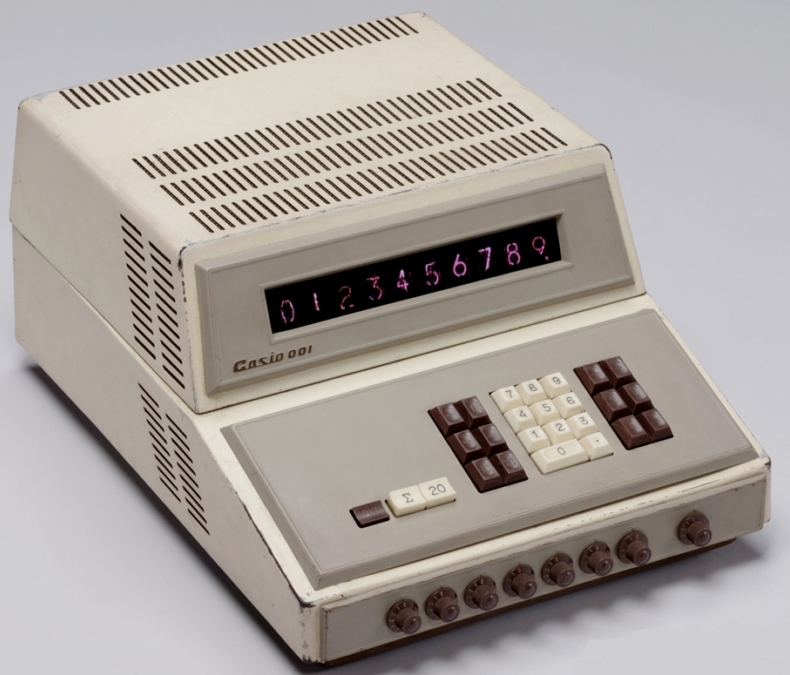 The Casio 001 is Casio's first attempt at a desktop fully-electronic calculator, introduced in September of 1965. Prior to the 001, Casio's calculators were based on relay technology, and while their relay calculators offered sophisticated capabilities, it was clear that pure electronics were the wave of the future. The Casio 001 offered ten-digit capacity, with Nixie tube display, and a ten-key keyboard. It was built upon discrete transistor circuitry, housed on muliple plug-in circuit boards. The knobs across the front of the machine could be set to provide a constant number which could be recalled for repetitive use -- a primitive form of the constant function provided in later calculators. This feature carried over from Casio's earlier relay-based calculators. If you have one of these machines, operational or not, I'm interested in hearing from you. Please write via the "EMail" link at the top of the page.